Cast aluminum sign letters - These are high quality professional lettering products. 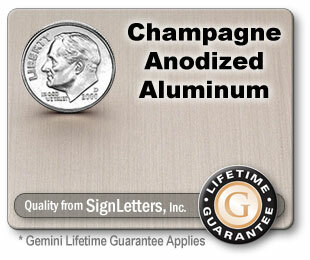 The Champagne Anodized Aluminum finish will have sanding strokes (a brush stroke appearance) for most typestyles. These cast aluminum letters have stroke-sanded faces, bead-blasted returns. Gemini Cast letters with Anodized finishes use aluminum alloy #514. This aluminum alloy is a member of the magnesium/aluminum family, which allows for excellent anodizing qualities. Bevel or round styles will have a bead-blasted surface and therefore will have a more "frosted" look to the letters. Choose details from below and enter which letters or numbers you need. Select options below & add sign letters to your online shopping cart. Multiple lettering lines? - Add each line individually. If lowercase characters are entered when they are not available in this letter style, the text will be made uppercase when added to your shopping cart. Quantity Need Multiple Lettering Copies?